Winter came late this year, so I had a bit of time after things calmed down post-wedding, -surgery, and -Thanksgiving to fill out my cold-weather wardrobe. 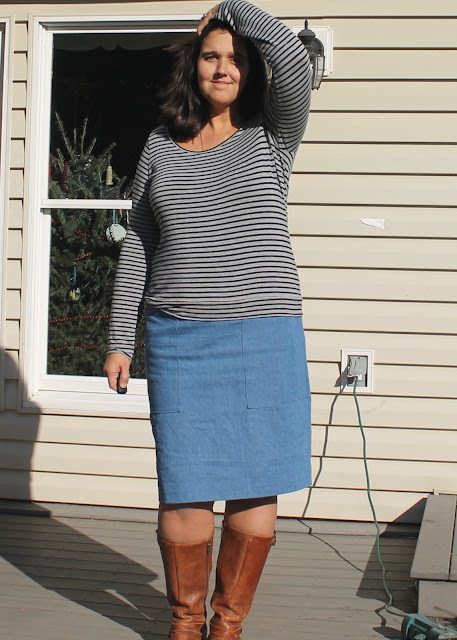 I pulled out my Renfrew pattern once more and sewed up three new tops. For these, I sewed a 10 shoulder increased to a 16 at the bottom of the arm scye. 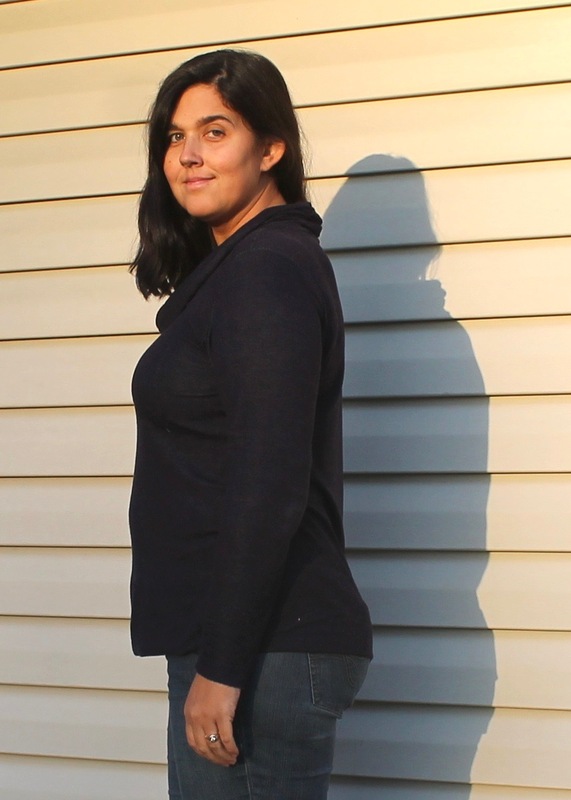 On my first top, made out of a denim blue rayon French terry from LA Finch Fabrics, I lowered the neckline to the lowest line on the front pattern piece. I forgot to lengthen my main bodice while cutting, and as I wanted a longer top, I cut my bottom band to 11" wide, to finish at around 5" once folded over and sewn on. I ended up slimming the arms significantly after I sewed it up, about 1" at the wrist tapering to nothing midway up my bicep. The sleeve was plenty long, so I didn't add the cuff, but I think I'm going to as the raw edges are raveling just the tiniest bit. For the black top, made of a cotton/lycra slub knit from Fabric Mart, I did the same size 10 shoulder increased to 16. I lowered the neckline a further 1", and cut the size 16 cowl with an extra 1/4" added to the seam on each side in order to fit the neckline. I also sewed up the sides with 3/8" seam since my black knit wasn't as stretchy as the French terry. I lengthened the body by 1" but cut the band according to the pattern piece. 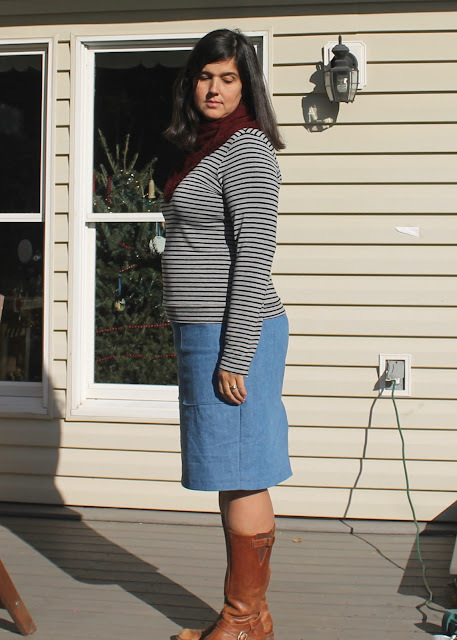 I find a black cowl-neck top to be a wardrobe staple in general, but this top was made specifically as a partner for a winter wardrobe orphan, the brown leopard McCalls 3341 I made earlier this year. 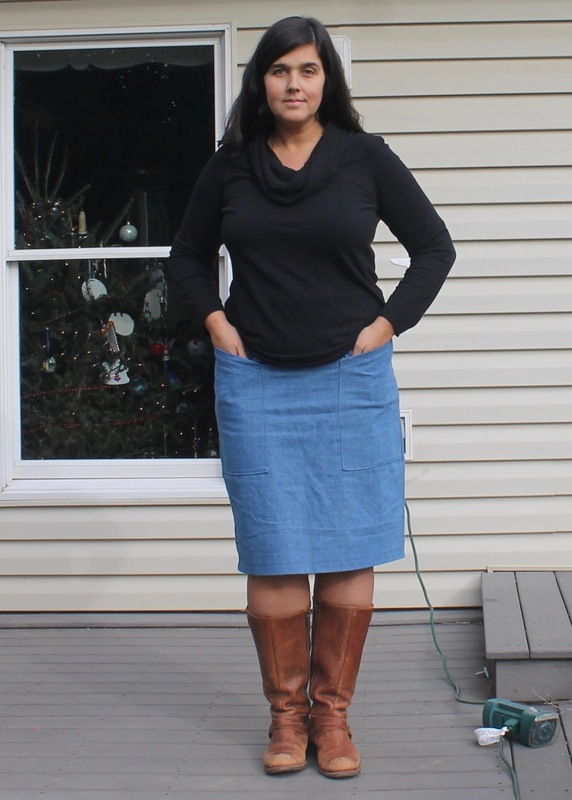 I wear the heck out of this skirt with a black tee in the summer, but it had no cool-weather partner. I sewed my third top to use up this rayon/lycra gray striped jersey. I didn't have enough of the fabric for the cowl, so I just made the scoop neck version. For this top, I kept the size 10 shoulder graded to a 16. But since I always have excess fabric in my armpit when I sew this top, this time I narrowed the shoulder from the sleeve by 1/2", and shaved 1/2" off the side seam at the bottom of the arm scye, tapering to nothing about three inches into the arm scye curve. I also ended up narrowing the sleeves on all three tops. I had to use the size 16 sleeves to fit my altered arm scye, but I tapered them in from about 1/2" at the wrist, ending at nothing midway through my bicep. I have transitioned to the mom washing cycle (at least, this was my own mother's cycle) - wear the same top two days in a row before washing - so these tops last me nearly an entire week. I do have some lovely bright red-orange wool jersey earmarked for another one. After mulling over these photos I feel the pop of color would be a welcome wardrobe addition so I should get on that soon. Such great basics!!! I really love the cowl neck style on me, and have no patterns with that feature. But buying the Renfrew seems silly when I have so many t-shirt patterns! 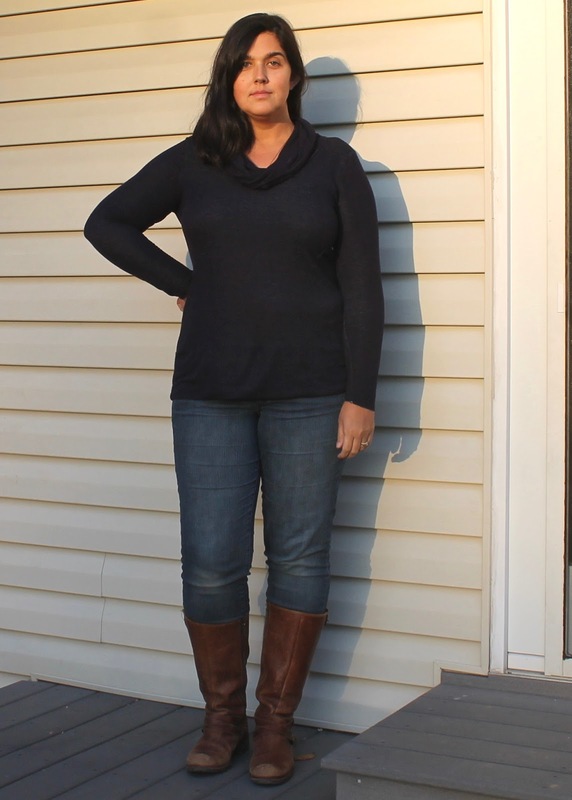 But, the cowl neck! Argh, you see my dilemma! I love the combo of the black cowl neck and leopard print skirt. You are so chic. "Mom wash schedule," LOL! The tops looks great and I bet they are super comfy, which is what we need when chasing active little humans :) Isn't it great to be able to make clothes that fits our bodies? I never thought I was doing the mum washing cycle hahaha but I do do the same thing pretty often! These look fabulous! My practice renfrew was not flattering but this makes me want to try again. Thanks, you should! I have had some issues with the fit of the pattern myself - but the cowl is such a nice feature! Great clothes you will definitely wear, bravo. These look GREAT! Well done! You're reminding me of how much I love this pattern! Basics are the best! Wow, the tops are amazing! They look fantastic on you!